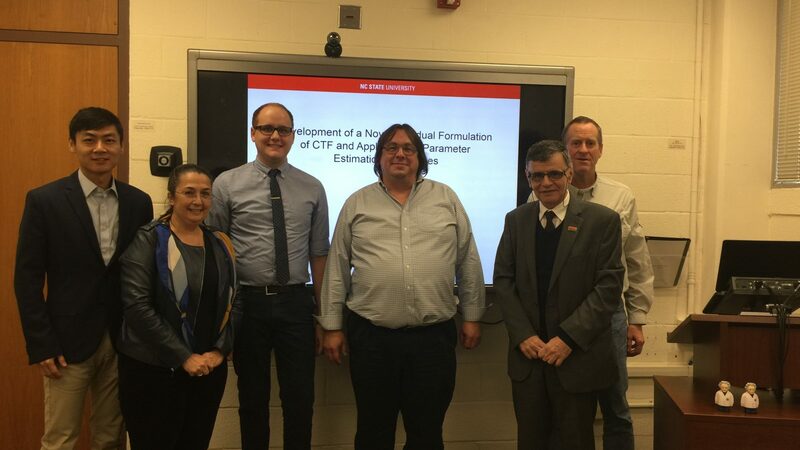 On November 2, Nathan Porter successfully defended his PhD dissertation,Development of a Novel Residual Formulation of CTF and Application of Parameter Estimation Techniques. Nathan’s committee consisted of his advisor, Maria Avramova, and members, Kostadin Ivanov, Jia Hou, Ralph Smith, and Vincent Mousseau. In modern science, computational modeling and simulation are often used in place of physical experiments. This is especially true in the nuclear power industry, where experiments are prohibitively expensive due to their extreme scales, high temperatures, high pressures, and radiation. Though the advent of the contemporary computer has enabled the design, testing, and construction of hundreds of nuclear reactors throughout the world, most simulation codes currently used in the industry were developed in the 1980’s. These codes were designed to utilize very limited computational resources, and therefore required many simpliﬁcations. Today’s computers have vastly improved memory and speed, and as such, these simpliﬁcations are no longer necessary. One such “legacy code,” Coolant Boiling in Rod Arrays–Three Field (COBRA-TF), was developed in the 1980’s to model the thermal hydraulic response of water in nuclear reactor cores. The code used in this work, CTF, is a version of COBRA-TF which is currently developed at North Carolina State University. Though various versions of COBRA-TF have been used extensively throughout academia and industry, its original simpliﬁcations are still present in CTF. A novel residual-based version of CTF, which enables the removal of these simpliﬁcations, is developed in this work. The code, called CTF-Residual (CTF-R), allows ﬂexibility in the implicitness, discretization, solution algorithm, physical modeling choices, and numerical solver used to solve the ﬂuid conservation equations. This is an improvement over the current version of CTF, which allows very little ﬂexibility in any of these areas. In addition, CTF-R is designed with modern coding practices—software quality assurance, veriﬁcation, and validation—in mind. Currently, CTF-R is capable of modeling single phase ﬂow with wall friction, heat transfer, lateral transfer, and nuclear fuel rods. Veriﬁcation tests are used to prove that the ﬁrst order numerical scheme is implemented correctly. Each model in the code is provided with a series of defect tests to ensure that it is accurate and error-free. Some models also include validation tests which compare predicted results to experimental data. Finally, a large number of regression tests are incorporated into the code repository to ensure that future changes do not break current capabilities. CTF-R includes four empirical models: wall friction, heat transfer from the nuclear fuel rods to the ﬂuid, thermal conductivity of uranium dioxide, and thermal conductivity of zirconium. A particular correlation is chosen for each of these models, and each correlation is provided with its origin, assumptions, and an extensive set of experimental data. Each of the four correlations is calibrated to the experimental data and the resulting parameter uncertainties are included with the code distribution. CTF-R is modern code that, with further development, will have varied future applications. The ﬂexibility in the residual equations will allow a more implicit solution algorithm, which enables the use of larger time steps for a particular problem. CTF-R could be used to ﬁnd a solution to the steady state conservation equations. Not only will CTF-R be capable of modeling light water reactors like CTF, but its governing equations, empirical models, and geometry could be adjusted to model next generation reactors. Given these important applications, the CTF-R framework established in this work will be an important contribution to CTF modeling.